With only a few weeks to go before our annual September conference, thoughts turn to the finalists of the ALPSP Awards for Innovation in Publishing, sponsored by Publishing Technology. The winners will be announced at the conference, but if you can't wait until then, here's the first in a series of spotlights on the finalists. We asked John Inglis, Executive Director of Cold Spring Harbor Laboratory Press, to tell us more about finalist project bioRxiv, the preprint sharing service for the life sciences that the Laboratory initiated in November 2013. JI: Cold Spring Harbor Laboratory (www.cshl.edu) is located 35 miles east of New York, on the north shore of Long Island. It was founded in 1890 and was historically important in the development of genetics and molecular biology last century. Today it has first-class research programs in cancer, neuroscience, genomics, plant science, and quantitative biology. But the Laboratory also makes a huge contribution to scholarship and the professional education of scientists through highly regarded conferences on its main campus and its center in Suzhou, China, laboratory and lecture courses, an innovative graduate school, a center and archive for the history of molecular biology, and the outstanding journals, books, and electronic media produced by its Press (www.cshlpress.org). So the Laboratory's long-established culture combines both doing science and sharing science with many thousands of investigators who visit our campuses and an even larger number worldwide who benefit from its publications. ALPSP: You have submitted the bioRxiv project for the Awards. Tell us more about how it works and the team behind it. JI: A preprint is the manuscript of a research paper that has not yet been accepted for publication by a journal. bioRxiv is a service for the open online distribution of preprints. It's free for both authors and readers. Authors categorize their manuscript in one of 25 life science subject categories and identify their findings as "new", "confirmatory", or "contradictory". The manuscript is submitted through an automated system that creates a pdf, attaches a DOI, and displays the abstract in the bioRxiv site. The pdf can be previewed and downloaded. Manuscripts are posted usually within hours of submission, with only minimal screening and no peer review. They can be revised any time and prior versions are retained on the bioRxiv site. Usage metrics and altmetrics for each posted manuscript are publicly available. When a version of a manuscript is published by a journal, a link is posted from the preprint to the paper. 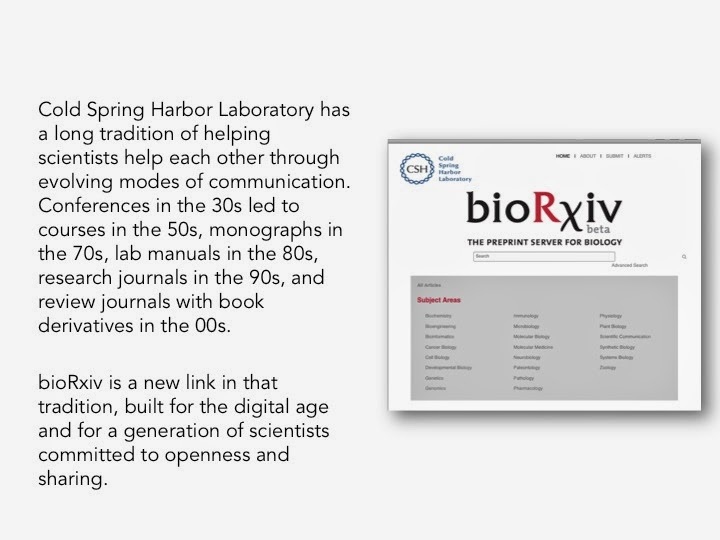 bioRxiv is a service of Cold Spring Harbor Laboratory managed by a small team within CSHL Press that includes co-founder Richard Sever, production manager Linda Sussman, lead technical developer Ted Roeder, and administrator Inez Sialiano. bioRxiv is hosted by HighWire Press, where it gets great support from Bert Carelli and the drupal development team and Kevin-John Black and the Bench>Press crew. We also rely very much on a group of about 50 bioRxiv Affiliates, young principal investigators who screen submitted manuscripts and assure us that the content is indeed science. JI: There is technical innovation in the automated system that ingests and posts manuscripts with minimal human intervention. But much more importantly, we see evidence that bioRxiv is beginning to change information practices within the broad sweep of life science. 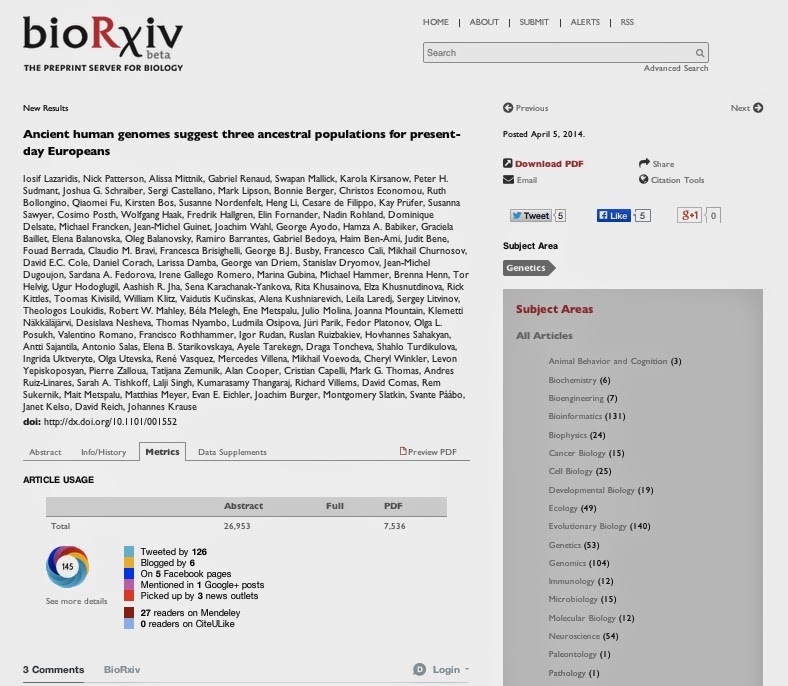 The long established online preprint server arXiv covers physics, computer science, mathematics, and since 2003, areas of biology with a quantitative component, such as population genetics. In only 8 months, bioRxiv has received more than 550 manuscripts and every one of the life sciences categories is represented. As expected, the largest categories are the more quantitative, such as evolutionary biology and bioinformatics, in which preprints are familiar but a substantial number of manuscripts are in cancer, genetics, cell and developmental biology, neuroscience, immunology, ecology - areas of science in which sharing preprints is a new behavior among authors. There are changes, too, among journals. Since bioRxiv began, many journals and publishers have either changed or clarified their policies to state openly that they will accept for publication manuscripts that have been shared as preprints. 20% of the manuscripts currently on bioRiv have been published in final form in a long list of journals that include the leading general journals and prominent titles in more specific areas. These journals understand and support the distinction between the sharing of information that bioRxiv makes possible and the validation of knowledge through peer review, a function that still resides with journals. Another area of innovation is the enabling of prepublication critical scrutiny and discussion of findings that bioRxiv makes possible. There is a commenting function on the site which so far has been used only for a small number of papers. But when it happens, there can be useful dialogue between authors and readers. There is a lot of social media activity around bioRxiv posts, including twitter discussion and blogging. And authors tell us they get a great deal of direct, private comment on manuscripts through email. It's our impression, therefore, even at this early stage in the life of the service, that posting a manuscript to bioRiv offers the author an opportunity for community feedback that could improve the manuscript before it's submitted to a journal for publication. And perhaps, therefore, speed its acceptance, although of course we have no evidence for that. In summary, bioRxiv is changing the way information in the life sciences is shared. It's helping quicken the pace of research. It's empowering early career scientists, who can share their results and gain visibility before they have built a publication record. And it's enabling investigators to create and share a citable, discoverable record of work accomplished that can be evaluated by grants and hiring committees, even though it has not yet been formally published. ALPSP: And finally, what are your plans for the future? JI: The Laboratory is committed to bioRxiv for the long term but we're impatient to spread the word about the availability of the service as rapidly as possible. We still have much to do to make scientists worldwide aware of the service and its benefits. We are still adding features and functions to the site and next up will be some general data about the relative distribution of preprints among subject categories and the journals that have published final versions. We are talking to publishers about their preprint policies and where appropriate, advocating for change. 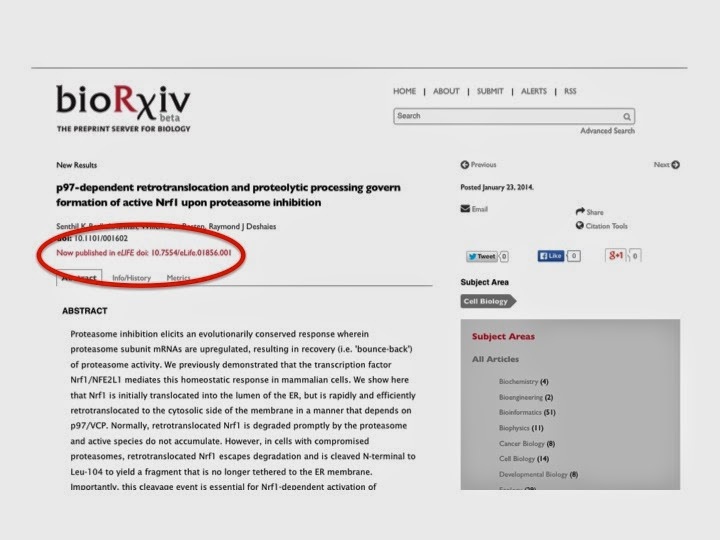 We may well develop a list of preprint-friendly journals on the bioRxiv site. Several publishers are interested in offering authors the possibility of posting their manuscript to bioRxiv at the same time it's submitted to a journal. We have tested this functionality in the Bench>Press submission system with one of the CSHL Press research journals Genome Research and many authors liked it, so we're working now with other journals that use B>P and would like to offer the opportunity via other submission systems. Other things we are considering include a rating system that readers can attach to posted manuscripts. We are excited about the rising rate of submission, increasing usage, extraordinarily interesting and important science being posted, and growing awareness and discussion of the information being shared through bioRxiv. Its future will be driven in a major way by what the community tell us they want the service to be. The ALPSP Awards for Innovation in Publishing will be made at the ALPSP International Conference. Book now to reserve your place.